The Ford Consul is a car manufactured by Ford in Britain. 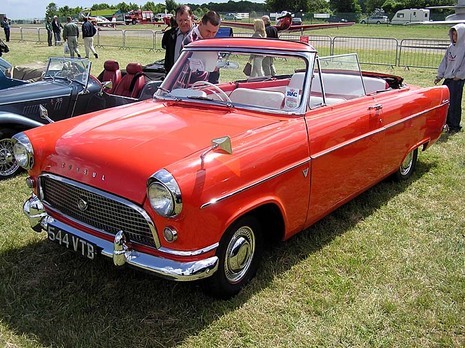 Between 1951 and 1962 the Consul was the four cylinder base model of the three model Ford Zephyr range. Consul, Zephyr and Zephyr Zodiac. In the 1962 restyle it was renamed the Zephyr 4, the mid range model becoming the Zephyr 6 and the top of the range just being called the Zodiac. At this point Consul became a four car range in its own right, the Consul Classic, Consul Capri, Consul Corsair and Consul Cortina. The Classic, Capri and Corsair were relatively short lived but the Ford Cortina, minus the Consul tag, went on to scale dizzy heights. The Consul name reappeared from 1972 to 1975 as a replacement to the Zephyr range and shared a body with the more luxurious Ford Granada Mk I. The Capri name was also reintroduced at a later date. 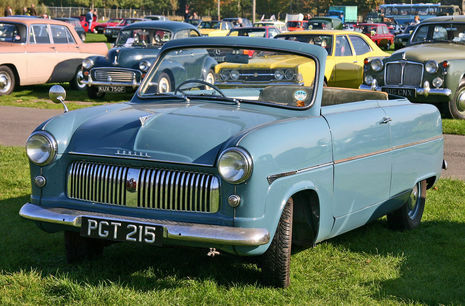 The Consul was first shown at the 1950 London Motor Show and was the start of Ford of Britain's successful attack on the family saloon car market and replaced the larger-engined V-8 Pilot which had only been made in small numbers. It was given the Ford code of EOTA. Most cars were 4 door saloons with body design by George Walker of the parent United States Ford company but a few estate cars were made by the coachbuilder Abbott. From 1953 a convertible conversion by Carbodies became available. The body was reinforced by welding in a large X-frame to the floor pan. Unlike the larger Zephyr the hood (convertible top) had to be put up and down manually. It was also the first car they built with up-to-date technology. The new 1508 cc 47 bhp (35 kW)  engine had overhead valves and hydraulic brakes were used but a three-speed gearbox, with synchromesh only on second and top, was retained. They were also the first production cars to use the now-common MacPherson strut independent front suspension, and was the first British Ford with modern unibody construction. There is a bench front seat trimmed in PVC and the handbrake is operated by an umbrella style pull lever under the fascia (dash). The windscreen wipers use the antiquated vacuum system. The instruments, consisting of speedometer, ammeter and fuel gauge, are positioned in a housing above the steering column and there is a full width parcel shelf on which an optional radio could be placed.